The following text appears also here on the Australian Ceramics blog. The interpretation or imitation of nature is inextricably linked to the continuous search to define art. 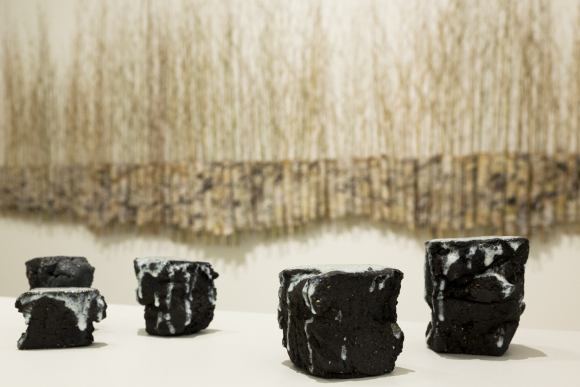 In Making Ground: Blue Mountains as Material, at the Blue Mountains Cultural Centre, Katoomba, until 6 October, the problem of interpretation or imitation has been, to some extent, eradicated. What connects the works in the exhibition is that they no longer take nature as inspiration or subject matter, but utilise it as material for creation. The catalogue for the exhibition opens with an explanation of the Aboriginal perspective on using natural resources. It describes the cultural practice of seeking permission from the custodial ancestral spirits of the place, and from the entity itself, be it tree, rock or clay. Such entities exist as a home for a range of living creatures, as well as being seen to possess an animate spiritual presence. Implied in the introduction is a world view that sees humans not just in harmony with the natural environment but part of it. We live in a world in which, all too often, humankind and nature are seen as two sides of a dichotomy. The falsehood of this dichotomy is revealed in Making Ground. Ceramics, since its inception as an art form, has always occupied a rare position in art, in that it has the capacity to be simultaneously medium as well as subject. 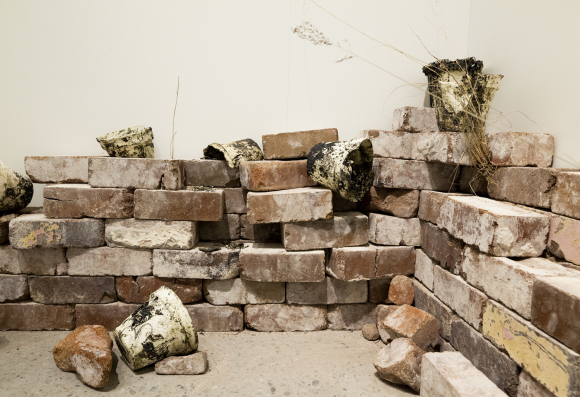 As such it is unsurprising, however much it is refreshing, that three ceramicists were chosen for inclusion in the exhibition, as it is this merging of medium with subject that renders the artworks of Making Ground successful. Simon Reece’s Escarpment Rocks (image above) are interpretations of the rocks that are, to Reece, the essence of the Blue Mountains. Their powerful beauty resides in their simplicity, in the elimination of the inessential. They are almost purely organic looking, except for the occasional deep clefts formed by fingers, which serve to separate them from mere imitations of escarpment rocks; they are instead spiritual offerings to them. The clay is not treated gently; it is torn, smashed and roughly manipulated. Yet in the serendipity of the textures and shapes formed by their making, and in their submission to the kiln, they echo the shaping of the escarpments through their surrender to weather and the movements of the earth. Whilst these works are maquettes for larger sculptures commissioned by the Cultural Centre, their smallness increases their power. They are mountains, distilled to a size that allows an intimate contemplation. They are more subtle, and thus more human than the sublime reality of their stimulus. They are unfinished sentences, but so too is the constantly changing landscape of the Blue Mountains. 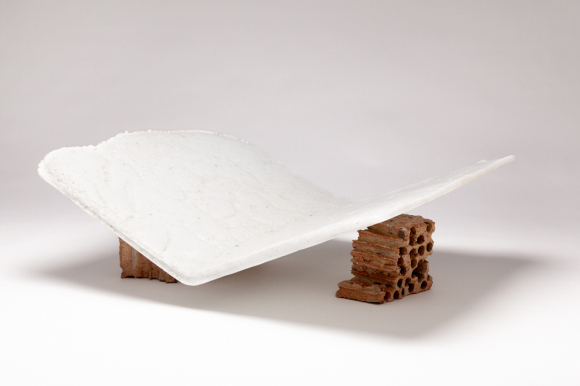 Bill Samuels’ works utilise clay as well as materials found locally. Studio Road 3, (image above) formed from fired road base, sits precariously on its rock tripod, speaking at the same time of nature changed by man, as well as the fragility of the relationship between the two. His works are full of transformations and contrasts, much like the human occupation of the Blue Mountains; the disparity of roads destroying the environment, whilst at the same time allowing access, and thus appreciation, of it. As the introduction demanded, there is an expression of gratitude to the environment conveyed in all the works, but more than that, they demonstrate the brief illusion of power over nature that we are permitted by nature herself, before she reabsorbs us. The works are thus cyclical, depicting the fragility of life and death, giving new life to dead matter and implicating our own place in this cycle. The artists repay the debt of their use of nature by shattering the man/nature dichotomy and by showing its viewers what can be gained by this: a reunion, a celebration of our place in nature, not over it. Humanity, like art, cannot exist without nature.